China on Saturday opened the first train service to Tibet across the world's highest railway, a controversial engineering feat meant to bind the restive Himalayan region to China. The first train bound for the Tibetan capital of Lhasa pulled out of the western Chinese city of Golmud after a nationally televised ceremony led by President Hu Jintao and attended by thousands of workers who helped to build the line. 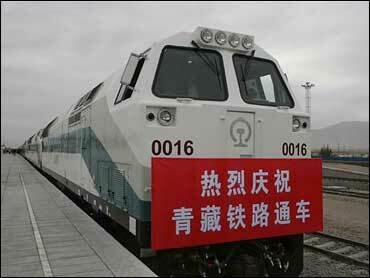 "This is a magnificent feat by the Chinese people, and also a miracle in world railway history," Hu said. He said it showed China's people were "ambitious, self-confident and capable of standing among the world's advanced nations." Musicians in traditional Tibetan and Chinese costumes banged drums and cymbals and Hu used golden scissors to cut a giant red ribbon as the first train pulled out of the Golmud station. Minutes later, state television showed a second train pulling out of Lhasa traveling toward Golmud. A third train was due to leave Beijing for the Tibetan capital later in the day. The 710-mile line crosses mountain passes up to 16,500 feet high and large stretches of ground that is frozen year-round. Specially designed train cars have oxygen supplies to help passengers cope with the thin air, while high-tech cooling systems keep the railbed frozen and stable. The $4.2 billion train is part of the communist government's efforts to develop poor, restive areas in China's west and bind them more closely to the country's booming east. Activists complain that the railway will bring an influx of Chinese migrants, damaging Tibet's fragile ecology and diluting its unique Buddhist society. They say most of its economic benefits will go to migrants from the east. On Friday, three women from the United States, Canada and Britain were detained after unfurling a banner at Beijing's main train station reading, "China's Tibet Railway, Designed to Destroy." Others planned to protest Saturday outside Chinese embassies abroad. Chinese officials acknowledge that few Tibetans are employed by the railway, though they say that number should increase. The government also says it is taking precautions to protect the environment. The railway is projected to help double tourism revenues in Tibet by 2010 and reduce transport costs for goods by 75 percent, the government's Xinhua News Agency said. Until now, goods going to and from Tibet have been trucked over mountain highways that are often blocked by landslides or snow, making trade prohibitively expensive. Communist troops marched into Tibet in 1950 and Beijing says the region has been Chinese territory for centuries. But Tibet was effectively independent for much of that time. Chinese officials have wanted to build a railway to Tibet for decades but were put off by the engineering challenges. The project was launched in earnest in 2001 after engineers decided they could deal with the high altitude and temperature extremes of the Tibetan plateau. In some places, crews building the line worked at such high altitudes that they were forced to breathe bottled oxygen. The railway's highest station will be in Nagqu, a town at 14,850 feet in the rolling grasslands of the Tibetan plateau. According to Xinhua, the highest point on the line is 16,737 feet, which the government says is a world record.